I like color. I especially love seeing a house come together, the entire process impresses and thrills me. A friend asked me the other day how things were going with this, my first investment home build… I told her I was equally thrilled and freaked out by the entire process. I was worried about interest payments, etc., then I calm myself down when I realize I only have to pay 3, or maybe 4 months worth of interest. It’s all good! Anyway, We were supposed to be getting brick laid starting yesterday, however, it’s been raining off and on for the past few days so the sand for the morter is too wet, so the brick-layers have not yet begun their work, but the painters came today said that the wood was dry enough to put a layer of primer on the wood-work, so here we have some primer. 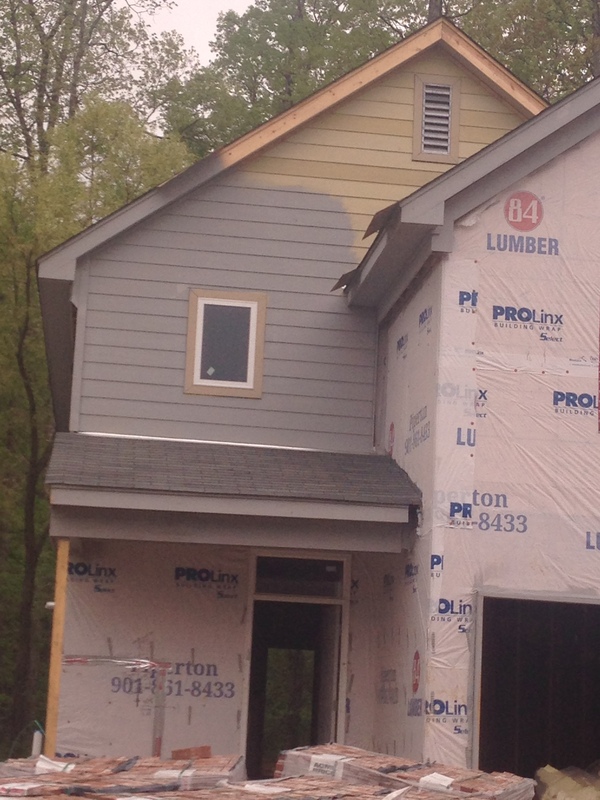 The siding will be about this color, but the trim/cornice will be much lighter as well as the trim around the windows and the garage door and column at the front porch. The shutters will be solid black and will be inset on the porch to the left of the front door to give the illusion of a window (but a window can no t be placed here because of the staircase directly beyond. Well, it COULD be a window, but it would have been very expensive tempered glass, and I didn’t want the liability of someone falling down the stairs, through the glass and out onto the front porch, so we simply omitted that window. 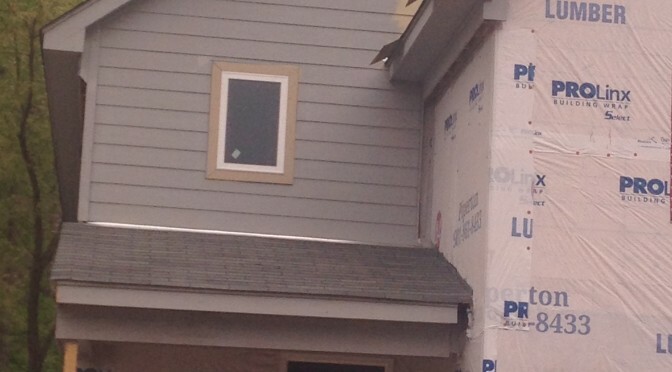 There will be shutters at the tiny window above the front porch as well as the window above the garage door. This house should be really cute when finished.